Why does the Republican Party always seem to betray conservatives in the end? How come Leftists never worry some “squishy” moderate will win Democrat primaries, even though conservatives in the GOP are constantly fighting that battle? Why do GOP leaders typically fight the conservative base harder than they fight the Democrats? How did the Left gain control of every major cultural institution in the country? Why does the Republican Party continue to fund (alleged) political enemies, such as Planned Parenthood? Is the GOP really the “the stupid party” or something much worse? 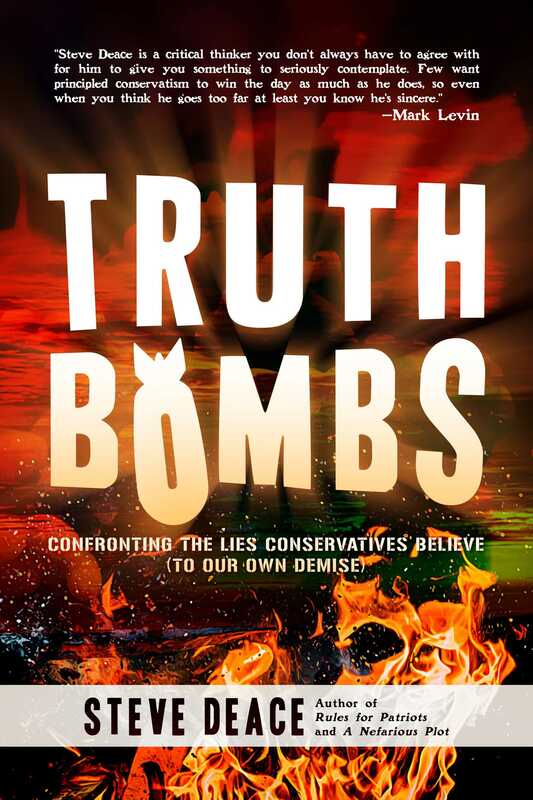 Deace answers these questions and more in Truth Bombs, a definitive expose on why conservativism has no future—if it remains hostage to the unibrow-party duopoly. "Steve Deace is a man who has two very rare commodities in today's media: a nimble and curious mind and the courage to tell it like it is. If you are a Republican and vote the party line 'because we just have to win', this book isn't for you, it is about you. In a clear and well researched voice, Steve gives you the truth of who we were, and who we have allowed ourselves to become. More importantly, he explains the why and how we must find our polar star once again, to lead the way out of the darkness of our post-modern world. P.S...this endorsement wasn't ghostwritten...you'll get the joke once you've read the book." "This is typical Steve Deace: well said, well researched, and not for those who like to be lied to. You can agree or disagree with his take on things, but either way, you'd be wise to at least consider what's in this book." "Steve Deace is a solid thinker and a consistent conservative. Take his advice to heart." "Steve Deace delivers on the promise in the title. This book is indeed a truth bomb, dropping bold and needed truths right into the fog of modern conservatism. Deace dissects the self-deluding lies rampant on the Right these days, and offers a needed antidote for each of them. This is a book we need right now, though perhaps not a book that mainstream, establishment conservatism wants."